Morse Mania is a morse code tutor for the Macintosh. It runs on Mac OS X 10.5 and later. Older versions are also available for those with older operating system versions. We're so sure that you've find Morse Mania useful that we're offering you a risk-free deal. You can go ahead and download a copy of Morse Mania for absolutely free. Give it a try, and see how easy it is to use. Once you've decided that you find it useful, go ahead and register your copy. If for some reason you decide Morse Mania isn't for you, just throw away your copy. That's it! Download a copy of Morse Mania right now, to try out without obligation! The cost of buying Morse Mania is only $19.99! Learn Characters - Each morse code character is displayed on the screen as it is being played. This is useful when you're first learning the morse code alphabet, as it helps you link each sound to the corresponding character. Guess a Character - Morse code characters are played, and you must type the key of the character sent. At the end of the exercise, your score is displayed. Copy Groups - Random words are sent (and displayed on the screen). You select how many words you would like to have sent, and practice by copying them down. At the end of the exercise, compare what you copied to what was actually sent. Keying - You can send more code by clicking your mouse button, and Morse Mania will decode it. Typing - Type characters on your keyboard, and Morse Mania will play them. Send File - Any text file of your choice can be sent. It also supports Farnsworth mode. Farnsworth is useful when first learning morse code, so you don't reach the "plateau" around 7 wpm, where you can't copy any faster, because you learned the individual dots and dashes that make up each character, rather than the overall sound. In Farnsworth mode, each morse code character is sent at a high speed, but with a long pause between characters. Hence, you hear the character as it sounds, and don't try to learn the individual dots and dashes that make it up. The long pause gives you time to think about what you just heard, and identify the character, before the next one comes along. Finally, the Koch method is also available. Using this method, you learn morse code at full speed, one letter at a time. It's considered by many to be the best way to learn morse code quickly and effectively. Koch mode is generall recognized at the quickest way to learn full speed CW. Koch himself was able to teach a group of students to copy CW at 20 wpm in just a little over 13 hours total time. Here's a brief description of the Koch method: You start off by learning just two letters, at full speed (15 or 20 wpm). Then after achieving 90% or better sucess in copying them, you add another letter. You keep doing this, until you have mastered all of the characters. As with Farnsworth, you hear the characters at full speed. The idea behind Koch mode is that you learn each character one at a time, and don't move on until you've fully mastered that character. You can learn at your own pace, and you get continuous immediate positive feedback as you learn each character. After you learn the first one or two characters, you realize that you indeed can copy CW at high speeds, and never hit the speed plateau that you otherwise would with traditional methods of learning CW. It is important that you only select one new character to learn at a time, and that you don't move on to another new character until you're getting accurate copy of all of the current characters. Some characters will take longer to learn than others, that's normal. 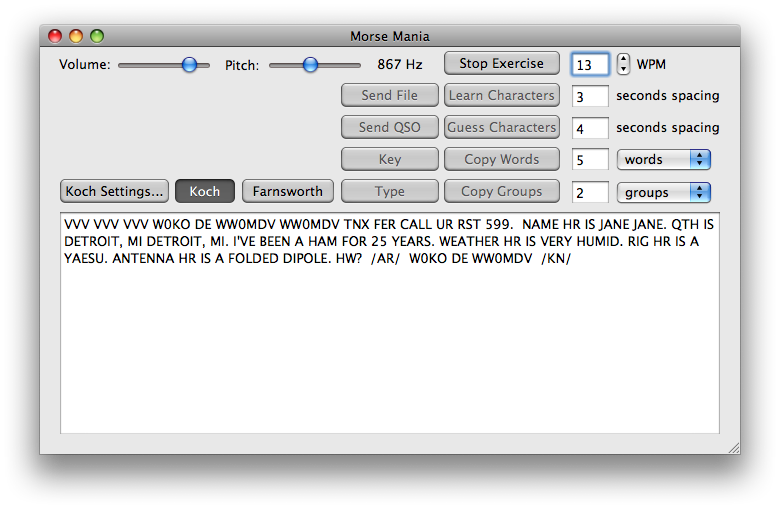 Morse Mania can also produce morse code from a text file, which is then also played out of your computer's speaker. So you can create your own practice sessions, or grab text from other sources such as newspapers/etc, to have a never ending supply of practice material. There is also a Typing Window, where you can type any valid character at the keyboard, and it is immediately translated into the morse code character, and played. The current version of Morse Mania is 5.0.1. The cost of buy Morse Mania is only $19.99! You may also want to take a look at Elmer, which can help you prepare for your written amateur radio test. You may register Morse Mania in conjuction with Elmer (An amateur radio written exam study program) for only $39.99, a savings of $5. Be sure to register the Combo to get the special price! Morse Mania is only available for Macintosh systems. My vote goes to MorseMania - and I have the HF license to prove it!